Suffern - On Tuesday July 23rd at approximately 1:37 am, State Police Troop T SP Tarrytown received a report from Rockland County 911 of a tractor trailer tanker on fire. 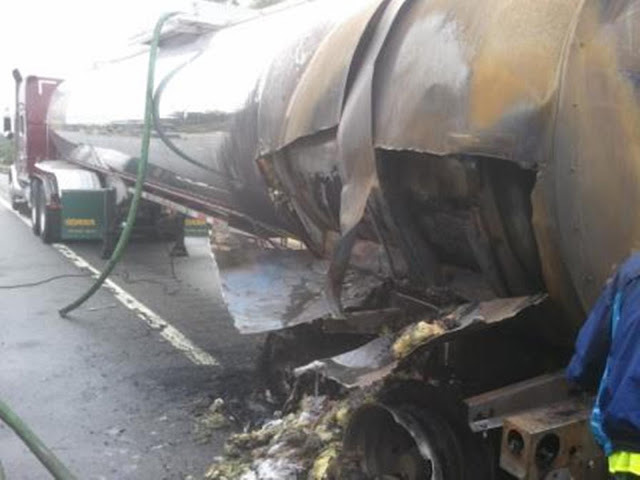 The tanker was located on I 87 south in the Village of Suffern and reported to be hauling liquid zinc. State Police and emergency services including fire, emergency medical services, and the New York State Department of Environmental Conservation all responded to the scene. The flames were quickly extinguished and no injuries were reported. The tanker remained intact and no hazardous material was released. State Police coordinated with the New York State Thruway Authority to create an alternate route for drivers in the area. As of 9:30 am, lanes near the scene are open, however traffic is moving slowly through the area. State Police are advising drivers to take alternate routes and to give themselves extra time for travel. For up to the minute traffic alerts, drivers in the Rockland area can tune to AM radio station 530.